Posted on Thu, Mar 15, 2012 : 11:44 p.m. The Washtenaw-Lenawee Chapter of the American Red Cross has established two shelters for people affected by the tornado that caused extensive damage in the Dexter area and a storm that caused flooding in Ann Arbor. 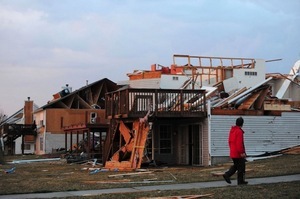 A man walks by a house that was damaged at York Street and Noble Drive in the Dexter area after a tornado hit the neighborhood. A shelter for tornado victims has been set up at Mill Creek Middle School, 7305 Dexter Ann Arbor Road. The flooding shelter in Ann Arbor, jointly operated with the Salvation Army, is at 100 Arbana Drive. Anyone who needs assistance as a result of these storms can go to one of the shelters. In addition to a place to stay, the Red Cross is providing food, health and mental health services and other basic needs. Hawes said many people have called asking how they can help. The best way is make a donation either by calling (734) 971-5300 or going to www.wc-redcross.org. The Red Cross is not accepting donations of food or clothing. People who want to make those kinds of donations can call 211, but she said monetary donations are the best way to help. Fri, Mar 16, 2012 : 10:34 a.m.
Fri, Mar 16, 2012 : 5:16 a.m.
Why no clothes or food donations? They are handing out clothes and food... Who will accept these donations? Fri, Mar 16, 2012 : 3:50 p.m. Most social service agencies in Washtenaw County ultimately get their food from Food Gatherers. If you really want to donate food, you could take it to the Food Gatherers warehouse. Also, there's a &quot;Rotate Your Food&quot; drive going on right now, with drop-off locations around the county. There's a complete list here: http://foodgatherers.org/?module=Page&amp;sID=rotate-your-food Protein sources (beans, peanut butter, canned fish or meat, soup) are always in short supply, so consider donating those! Fri, Mar 16, 2012 : 3:13 p.m. I agree, but there is a number above if that is what you want to donate, but money is best and easiest to work with. Fri, Mar 16, 2012 : 4:37 a.m. If any of those who have had to leave their homes have pets, will the shelter let them bring them in? Does HSHV have a policy about temporarily housing pets of disaster-struck homes? Is there a network of temporary fosters or something, so people know their animals are somewhere safe if/when they can't take them to the shelter? Do they need food or help? Fri, Mar 16, 2012 : 3:51 p.m. There are some photos at the Dexter Patch web site that show the emergency response from Thursday night - one of them shows an animal rescue group.